Dressed in the most select hides from Tuscany, Genesis Naylor's handcrafted backgammon boards are of incomparable character and quality. Each boasts a lissome leather playing surface, available in a variety of vivid hues and accented by sturdy brass hinges and a rugged but refined screw-secured closure handle. Set also includes 42mm leather checkers bolstered with brass rings and nestled in custom-fit board slots, engineered with a 1mm gap to provide snug comfort. The pair of leather cups come laced, lined, and lipped to promote maximum pip rotation. The preeminent precision dice are available in a multitude of colors. 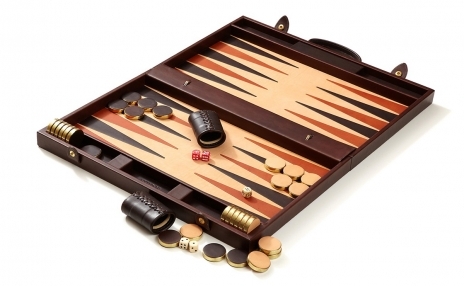 Each set contains a protective leather cover, matched to the board, so that your Genesis Naylor backgammon set conveys its charisma and class for years to come. Sets come in bordeaux, green, mahogany, navy blue, tan, or tambola. Precision dice colors are dark red, dark blue, lavender blue, dark green, hot fuschia pink, golden amber, black opaque, or white opaque. Secure case locks are optional. 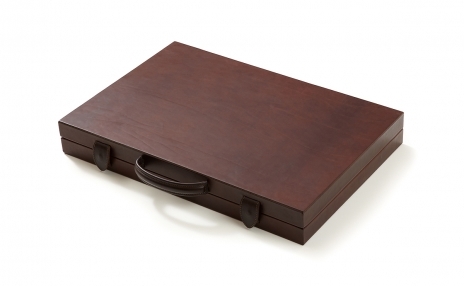 Size (closed): 20.1" x 13.6" x 2.8"
Size (open): 20.1" x 27.2" x 5.6"